Stumped by foreign languages when you’re traveling? Google Inc. is working on software that translates text captured by a phone camera. At a demonstration Tuesday at Mobile World Congress, a cell phone trade show in Barcelona, an engineer shot a picture of a German dinner menu with a phone running Google Inc.’s Android software. An application on the phone sent the shot to Google’s servers, which sent a translation back to the phone. There was no word on when the software would be available. Software that translates text from pictures is already available for some phones, but generally does the processing on the phone. By sending the image to its servers for processing, Google can apply a lot more computing power, for faster, more accurate results. The phone still won’t order for you, though — you’ll have to point at the menu. The demonstration was part of Google CEO Eric Schmidt’s keynote speech at the trade show, the largest for the wireless industry. He said phone applications that take advantage of “cloud computing” — servers accessible through the wireless network — will bring powerful changes to the industry. Google and Facebook are on a collision course in the increasingly competitive market for social networking services. On Tuesday, Google introduced a new service called Google Buzz, a way for users of its Gmail service to share updates, photos and videos. The service will compete with sites like Facebook and Twitter, which are capturing an increasing percentage of the time people spend online. The links shared on those social networks are also sending a growing amount of traffic to sites across the Web, potentially weakening Google’s position as the prime navigation tool on the Internet. Separately, Facebook plans to announce on Wednesday that it is improving the live chat service on its site by allowing it to be integrated into other services like AIM, AOL’s instant messaging network, which is among the most popular in the United States. Buzz is Google’s boldest attempt to build a social network that can compete with Facebook and Twitter. The service is built into Gmail, which already has 176 million users, according to comScore, a market research company. And Buzz comes with a built-in circle of friends, a group that is automatically selected by Google based on the people that a user communicates with most frequently in Gmail and on Google’s chat service. Like other social services, Buzz allows users to post status updates that include text; photos from services like Google’s Picasa and Yahoo’s Flickr; videos from YouTube; and messages from Twitter. 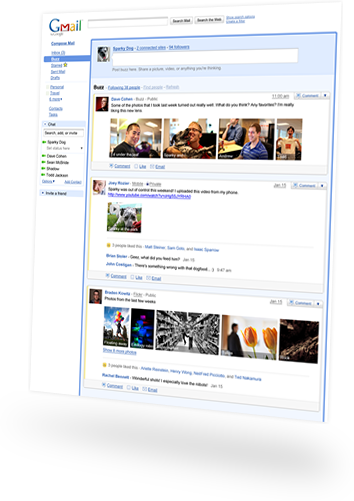 Analysts say many of its features mimic those of Facebook. “It is a direct challenge to Facebook, in particular,” said Jeremiah Owyang, a social media analyst with the Altimeter Group. Still, Buzz faces a struggle against Facebook, which recently announced, on the occasion of its sixth birthday, that it had 400 million users. Buzz also risks further overwhelming people who are struggling with Web services that generate ever-increasing amounts of information. But Google executives said that, on the contrary, Buzz would help tackle the problem of information overload, as Google would apply its algorithms to help people find the information most relevant to them. Sergey Brin, a Google co-founder, said that by offering social communications, which have primarily been used for entertainment purposes, Buzz would bridge the gap between work and leisure. “Bridging those two worlds is very powerful,” Mr. Brin said at a press conference, adding that he had used Buzz to help him write an Op-Ed article for The New York Times by soliciting input from other Google employees. Google has also woven Buzz into mobile phones, through a mobile Web site and a Google mapping application. Users will be able to see updates that friends have posted from particular spots. DataSea is software that tells you about things. Ask it about X and it tells you about X, instead of finding hits with ‘X’ in them. Ask it about X from the point of view of Y, and it will tell you about X and Y, and also things which form connections and relationships from X to Y.
DataSea is a data architecture and an application that gives single-step access and control. It reduces the need for navigation and clicking. It answers complex questions and makes mini-reports in one step, which can not be done with search engines. It lets you do things like make calls and send email, also in one step. DataSea gives answers based on your input by using human-like reasoning to find the relevant connections among data. It supports natural language and can access a wide range of data sources, including relational databases, as well as unstructured sources, such as ad-hoc notes.